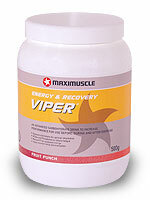 Viper has got to be the most popular and well known Carbohydrate CHO powder in use. Viper really is top stuff. Maximuscle Viper is an excellent product to mix with your Creatine powder to make your own Carbo. loaded Creatine mix, add a couple of scoops of your favourite protein powder too and you have the perfect post workout shake. With regards to Maximuscle Viper flavours, Orange is very ... Orangey, Fruit Punch is personally my own favourite , and I have yet to taste the "NEW" Pink Grapefruit flavour. NOTE - Some folks dislike Fruit-Punch intensely so my opinions are purely on a personal basis. There really isn't anything on the market that can compare with Maximuscle Viper in my opinion. Maximuscle Viper is the first carbohydrate drink to be formulated in line with the very latest research on rehydration and energy requirements, as opposed to making research fit the formula. Intense training in hot or cold weather can result in a loss of up to 1-2 litres of water every 1-2 hours. For each litre of water lost, you lose 25% performance, resulting in a loss of coordination, strength, concentration and focus. It doesn�t matter whether you�re bodybuilding or running marathons, replacing these fluids is vital. How you do it is critical, if you want success! Drinking plain water or strong carbohydrate solutions (greater than 20%) can further dehydrate you. Research has proven that the most effective way is a 6-8% (Isotonic) Maximuscle Viper solution combined with the electrolytes and salts you lose through sweating. Independent research has shown this formula, offers a whopping 25% better rehydration than simple carbohydrate drinks and a massive 50% better rehydration that plain water. On top of this great formula, Viper also contains 7.5% peptides and branch chain amino acids for even greater recovery during and after intense training, as demonstrated in research. Maximuscle Viper is the most popular choice of drink amongst knowledgeable athletes and coaches. Try it for yourself and feel the difference. Maximuscle Viper contains no stimulants, is 100% legal and allowed in all IOC tested events! It�s instant mixing and tastes great. Now available in convenient sachet format. This formula cannot be easily or cheaply produced in a �ready to drink� version, hence why the popular sports drinks do not compare! "Viper is an excellent all round, energy, rehydration and recovery drink - brilliant"
Mix 1 scoop (50g) in 500ml (approx 1 pint) of water or a water bottle. Sip over 60 minutes and stop drinking all fluids 20 minutes before training. Mix 11/2- 2 scoops (75-100g) in 500ml (approx 1 pint) of water or a water bottle. Drink within 15 - 20 minutes after training. This is your golden half-hour. It�s vital to replace lost fluids, carbohydrates and salt during this time to promote maximum rehydration, glycogen storage and recovery.